Cloudfone modestly announces a 5.3-inch phone with killer battery life! Known to its name since the Thrill 430x, Cloudfone outs the Thrill 530qx - a capable phablet that could boost you day to day productivity without having to stay near your wall outlet. Specs-wise, the screen is treated with an IPS qHD capacitive display that could enhance your user experience. The quad-core CPU clocked at 1.2GHz could also instill inferiority complex to other handsets on its league. Plus, a gigabyte of RAM will do all the stuff thrown at it without flaw. It'll also be backed up by a 4GB ROM expandable to 32GB. For mobile photographers, Thrill 530qx bolsters a capable 12-megapixel back shooter and a 5-megapixel "selfie" front camera. What keeps this handset on silver spoon among its peers is its whooping 4500 mAh battery that is definitely on top of the bars (even compared with premium phablet-makers like Smasung, HTC and LG). However, just like the 430x, this one is also thick in 11.8-millimeter depth and 200-gram weight. Android 4.2 Jelly Bean will be runnning the whole show on this phablet. If you're in the market for a capable phone with a large battery life and not bothered by the chuck on its hardware. 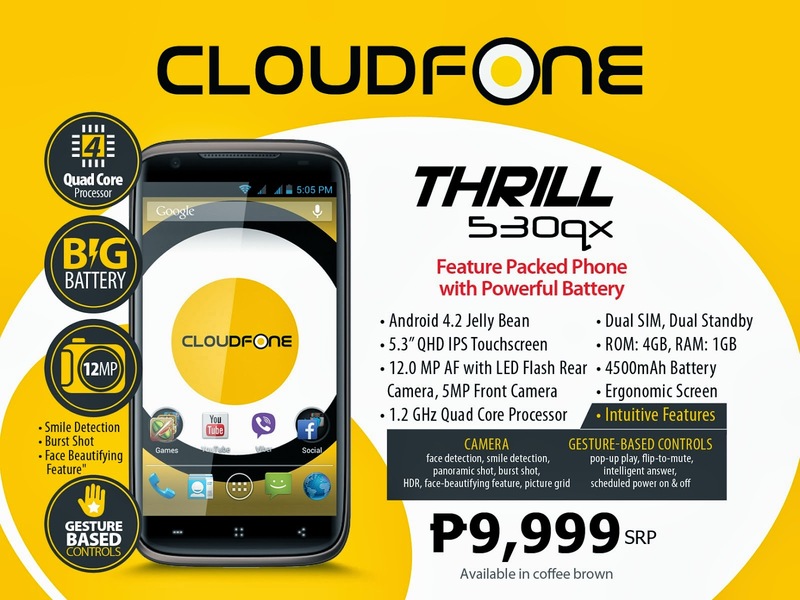 The Cloudfone Thrill 530qx is for you. It'll be available on the 1st of October on a good price of Php 9,999.